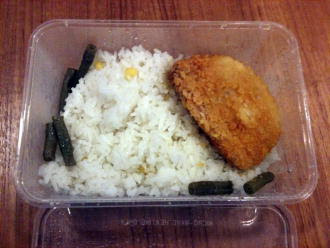 Youth Olympics packed lunch - rice with bits of corn 6 long beans and a deep fried piece of "chicken"
I read with much bemusement in the Straits Times today about the pathetic pack lunch they gave to volunteers at the Youth Olympics. 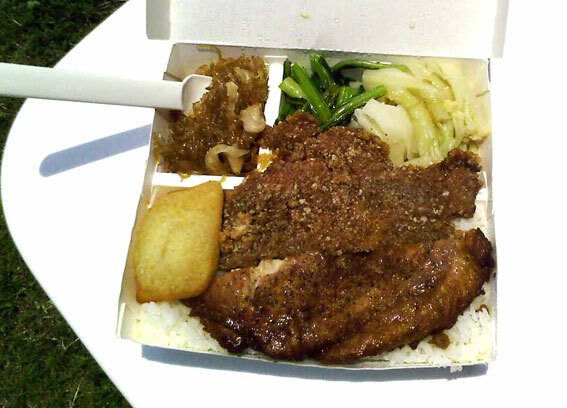 This reminded me of how good our lunches were at the World Games last year in Kaohsiung Taiwan. Everyday including Friday practice and Captains Briefing, we were asked for our food preference and given a packed lunch which was not only generous but actually really delicious. We'd get Japanese rice, a big piece of breaded pork chop AND a piece of braised chicken chop which were well cooked and not cheaply deep fried. The accompanied rice noodles and 2 types of vegetables or tofu were also delicious and not just something thrown in. There is also a sweet bun in the packed meal.And after lunch they gave everyone a Taiwanese version of Yakult to help with digestion. I must say that this was also the same food we got when we made our first trip to Taiwan to play in the Taiwan International Paintball Tournament a year earlier. I'm saying that they really take good care of you when you go up to Taiwan to play paintball. Shame on you Singapore Food industries for providing a pathetic packed lunch for a "World Crass" event such as the YOG. Imagine playing at night with the city lights in the background. The media will gobble it up. With the growth of the PALS league and talk about bringing the show to Singapore. I'd like to throw my thoughts into it. 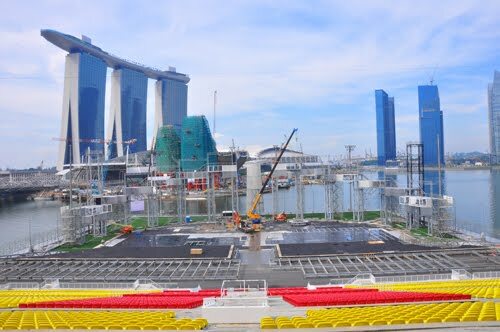 I've always had this vision of playing a Paintball tournament on the "The Float" which at Marina bay which is the world's largest floating pontoon at 120m long and 83m wide. The size of the pitch will be more than enough to accommodate two paintball fields and the stands can sit up to 30,000 people. The view from the platform with no less than 5 world class hotels in the background. The Float or otherwise know as the Marina Bay Floating Platform was designed to serve as a venue for Singapore's National Day parades and it has hosted concerts, football matches and the Singapore Formula 1 Grand Prix runs through it - in and out under the stands. And with the football pitch is artificial turf....YES TURF- there is turf on the field. This would certainly rival the cool factor of playing on the beach at Huntington or Malaga. The cool factor of playing on water on the bay would definitely be sky nigh - the views would also be spectacular. There are stadium lights in place which will be awesome if games were played at night with views of the city sky line in the background. 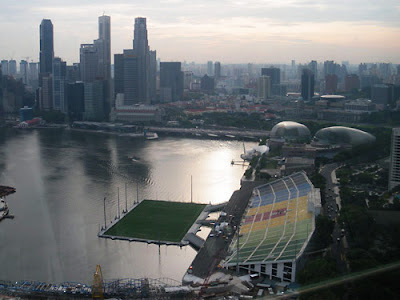 Hotels shopping centers and food outlets surround the Marina Bay Area - the Sands Casino Resort is just across the bay. Busses and Train run centrally to this area. 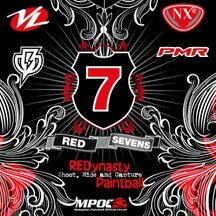 It would be the perfect and "The Coolest Paintball Tournament on Earth"
Why Singapore? Because its easy to get there- flights form every major city in Asia. Easy public transportation. Take a cab or the train or even walk from your hotel to the field. Most importantly the media is centered in Singapore. 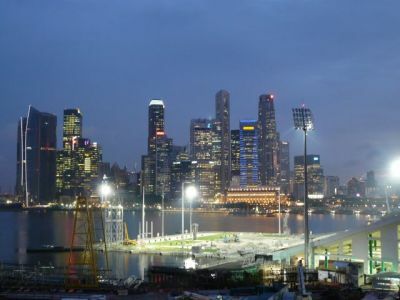 ESPN STAR is based in Singapore. If we had an even like this they will surely come out and cover this. Anyway its just my dream and mine alone. 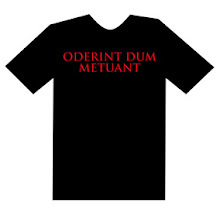 I thought I'd just stir the pot a bit and put it our before anyone else claims that my claim was copied. Paul Lam I know you read my blog - what do you think? Like the venue? 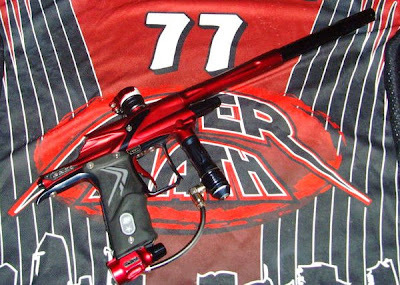 The breaking news from yesterday was a huge one for Paintball and Paintball in Asia. This is the press release on PbNation announcing that there will be a PALS - Paintball League Asia Series leg in China next March. This is huge for Paintball because as everyone knows- China is a huge potential market of 1.3 billion people. 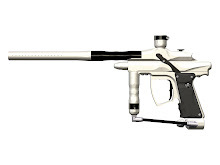 If and when the Chinese do pick up paintball, the sport will grow tremendously and paintball manufacturers will go 'ka-ching-ching'. 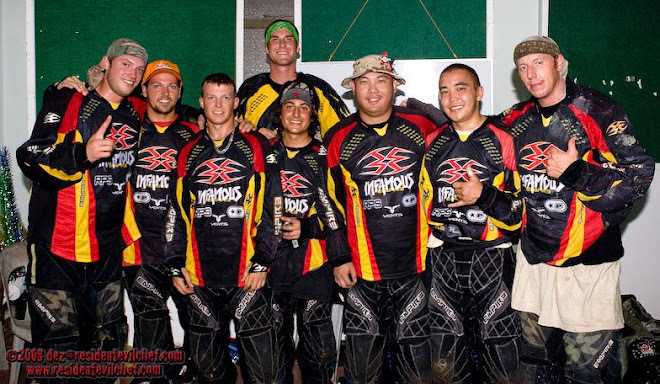 It is also a great thing for Paintball in Asia with the PALS - Paintball Asia League Series being the first Paintball league to organise a tournament in China. 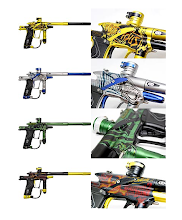 The prestige of the PALS league will be higher than ever and will thus surely now be the attention of the other major Paintball leagues in the world. PALS China was in the making since the beginning of the year. Australian Michael Whybrew spoke about it to us at the Sultan of Kedah Cup in May and finally it is a reality. My congratulations to the two Micheals Whybrew and Tan for making PALS China a reality. The China Cup is set for the 24th - 27th March 2011. At Noob Wars yesterday - I noticed a lot of teams filling up the back 3 bunkers (YELLOW). 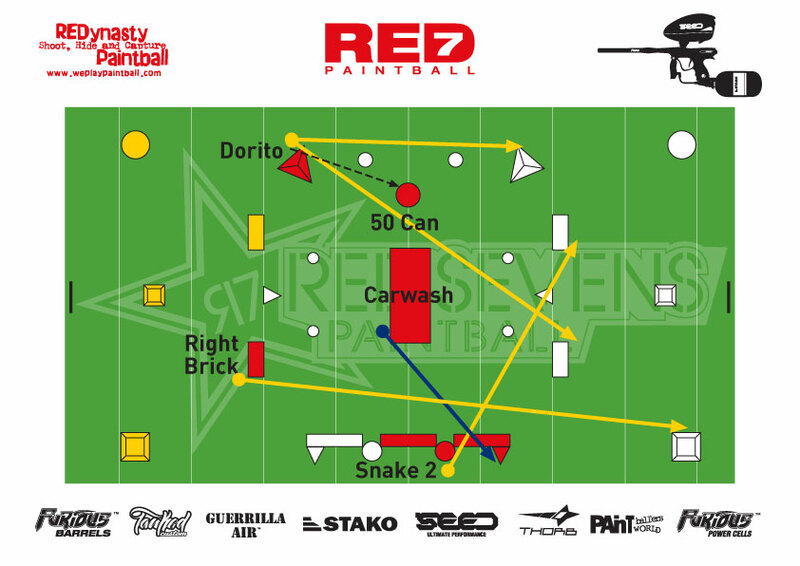 I would have pushed for the Dorito - Carwash - Right Brick and Snake Bunkers (Red). If we dont go into the snake straight we'd stop at the Back Right or the Right Brick. I wouldn't bother with the Back Left Can- its too far back to be efffective. If there was someone in there he should look cross into the snake. Tape side is a waste of time. Normally teams would have a snake corner to cover the snake but again a lot of them were either crossing in or simply not helping their snakes enough- its far back to be effective. Much easier to shoot somebody in the snake from the Carwash. Carwash is an easy fill straight from the break- just run low and slide into it. He should play right and look to lock their snake out. Put a lane in front of snake 1 and should have the advantage to stand up and shoot down into the snake. Car wash also protects his snake guy from any bunkering move. Snake - should go straight into snake 2 as soon as possible - shoot out their car wash and doritos and bricks. 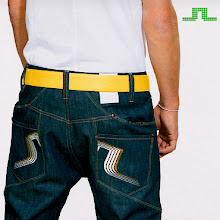 The snake can stand up on the cans and look to wrap out to shoot the bricks and push their back left to the outside. Right Brick is to help keep their right back from shooting on the inside and to protect his snake guy. I would put somebody into the Dorito every game looking to wrap on the outside - first to kill their Dorito and wrap out on their brick and cake and Back right. He should try to push into the 50 Can and should be relatively well protected from their Left back. Teams that got to the 50s first tend to have better advantage. The more guys you have in the 50s meant more firepower nearer to them and better chances of shooting them out. Teams that shot out the opposite snake also stood a better chance to move into the 50 zone. There were a few gun fights in the snake - which I felt was a waste because in the snake your job is to move up and shoot across the field- not hunt for the other snake guy. We had one snake player going the highway twice to bunker his opposite snake but he got shot by the back left in the process. I didn't see the need to fill both bricks- if you can get up there- might as well fill the car wash. If the Dorito guy can hold off or shoot out his opposite dorito- the D side will be locked down. If you had a guy in the car wash you'd pretty much stop them from moving up until they get you out of there. I felt that teams should have worked on the break outs running forward gunning the snake side for the snake rather than take the corners.